This is a lovely versatile chutney that is tangy and herby rather than sweet. It is the cornerstone of all North Indian snacks. We love it with our samosas, bhajis, pakoras, kebabs and most other things. There are many variations to this chutney, some will add a little sugar, some raw garlic and others will add yoghurt. This is how we like it in my family and it is a perfect base from which to experiment if you feel like. 1. Blend together all the ingredients, adding only one chilli to start with as the heat varies a lot from one batch to the next. Blend until very smooth and creamy; it might take a few minutes. 2. Taste and adjust seasoning. Keep in a glass jar in the fridge or freeze until ready to use. 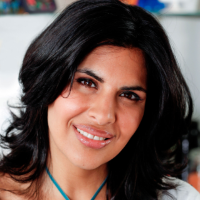 Serve with Anjum Anand’s Barbecued chicken tikka sandwich see recipe here.